Da Vinci Diamonds is not the most thrilling game to play. Its graphics is mediocre at best, the sounds are unpleasant and the game's RTP is below average. That being said, the game has an interesting bonus feature that makes it more enjoyable to play. The theme of Da Vinci Diamonds is perhaps better explained as Da Vinci and Diamonds. The link between the graphics of various precious stones and the paintings by the Italian master is not ever explained. 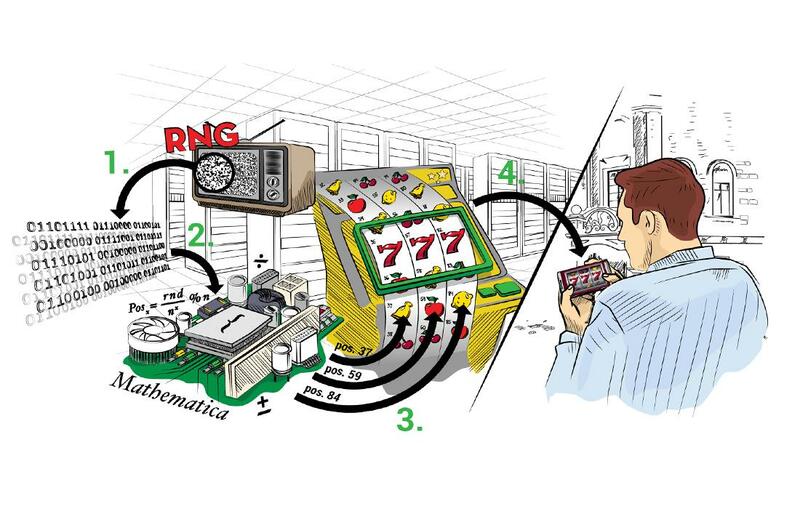 Instead the player is immediately greeted with a layout of gems and paintings and then asked to place their bets. Although the theme is a little obscure, the imagery is distinct and clear. The symbols do their job well, and are clear and intuitive. They make for a colourful and clear setting, but not one that is pretty to look at. The graphics are functional but not very attractive, bright without being cheerful. It is a bit of an eyesore, when your consider how slick and stylish most modern slots are. On the other hand, the animations are smooth and clear, much closer to what you’d expect from a modern slot machine, but the biggest weakness of the game is the sound design. The spin and drop noises are well designed; but the noises made when you win are cheap and jarring. It’s hard to enjoy a win when the sound it comes with is so unpleasant. The gameplay is slick and fast. The game gives you no time to work out how you’ve won before the computer is calculating your win and paying you out. So if you’re looking for fast paced action then strap in and try to keep up. The autospin feature is better paced, sometimes on fast games like this the autoplay can be too quick. Here it allows just enough time to enjoy each spin before moving on to the next, keeping the player interested. Some variation in the rhythm of the game is provided by the dropdown feature that destroys winning symbols and allows new symbols to fall in from above which can give you a chance of getting a series of wins. As well as the dropdown feature, Da Vinci Diamonds also has two other symbols to generate action. The first is a Wild symbol that can play as any other symbol to make up your winline. The other is a Bonus symbol, match these up on a winline and you get a batch of free spins. 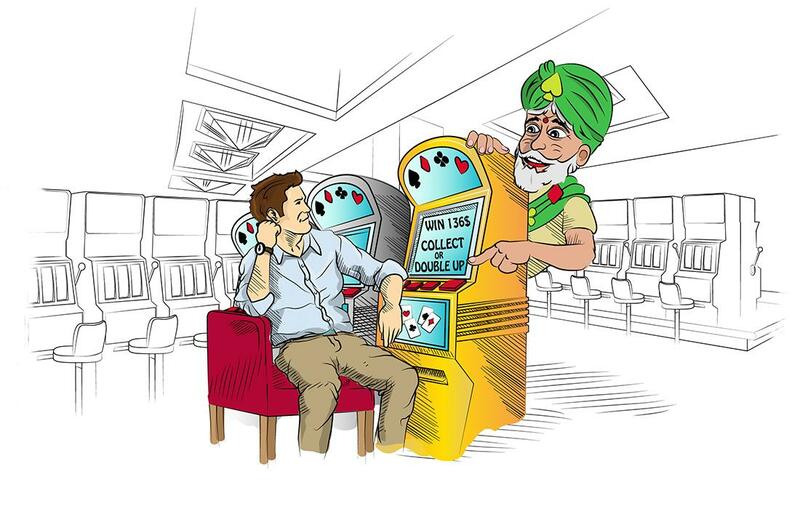 And you want to do that, since the free spins are where the real winnings are to be had. 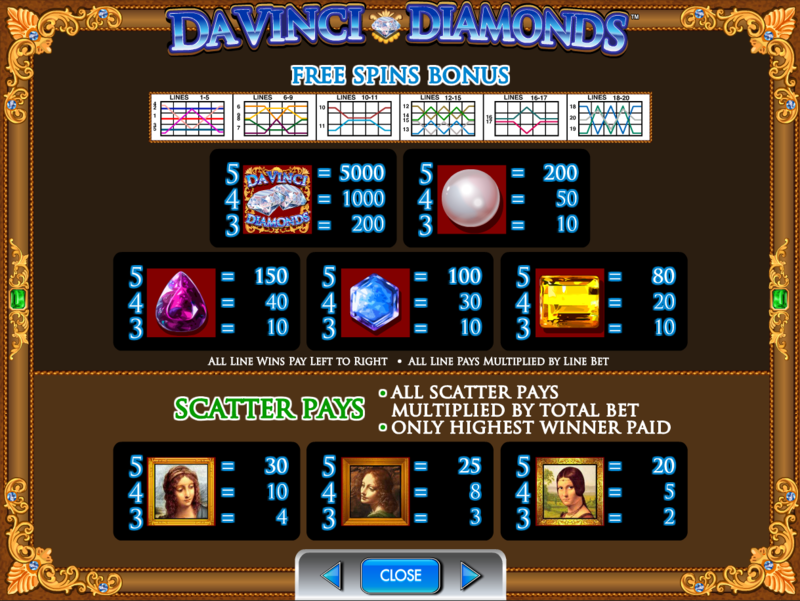 The reels change for the free spins, with new symbols and new payouts. The main change in the payout structure on bonus spins is that there are a larger number of medium sized payouts with much fewer big wins, and fewer very small wins for hitting winlines. There are also fewer winline symbols since three symbols are now scatter pays, which earn you small amounts more regularly. You can also win further bonus spins during these rounds making for a nice long interlude with the chance for racking up a long sequence of payouts. The game allows for bets of 1 to 50 coins (for example, on the version we tested the coin size ranges from 1p to £1) and this makes for plenty of room to play the systems we suggest here on Casino Guru. The highest possible winline in regular play is x5,000 the bet per line. This is a return of €/£/$5,000 for a €/£/$20 outlay of €/£/$1 per line, but the lack of multipliers on this slot machine actually makes for a moderate to low level of variance which makes it unsuitable for some of the strategies we suggest on this site. Da Vinci Diamonds has an RTP of 94.94%, which is a little lower than average for modern slots. The industry standard is about 96%. 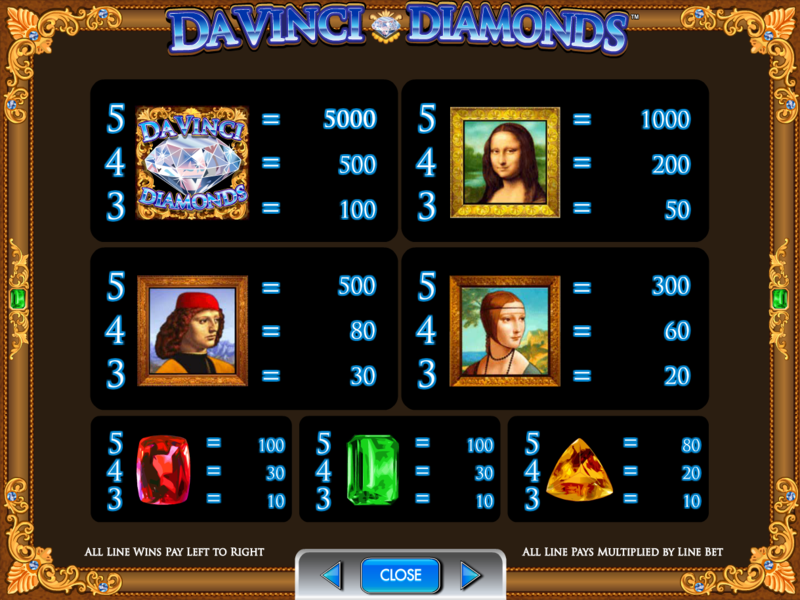 Da Vinci Diamonds is a solid slot machine with some nice features and a good pace, but unattractive to look at and to listen to. I would have welcomed some more variety in the style and outcomes, but overall it is a solid example of its kind.